Ed Sheeran temporarily stopped his latest sell-out concert on his world tour to go to the toilet – twice. The Grammy award winning singer halted his Saturday night set in Cardiff because he “needed a pee” after performing his smash hit Galway Girl. Then three songs later Sheeran stopped in the middle of singing Photograph, saying “I’m so sorry Cardiff” before running off to the toilet again. The 60,000 Principality Stadium crowd cheered when he returned to the stage. The 27-year-old then continued singing where he left off. Sheeran drank many bottles of water early on in the hit-filled set. On returning following his first trip to the toilet he told the crowd: “I’ve been gigging since I was 14 and I’ve never done that. The Saturday show in Cardiff was the penultimate gig of the UK leg of his bumper Divide world tour before it returns to mainland Europe and Amsterdam on Thursday. It was also the third night of Sheeran’s record-breaking mini-residency at the Principality Stadium, being the first artist to have four successive nights at the Cardiff arena. 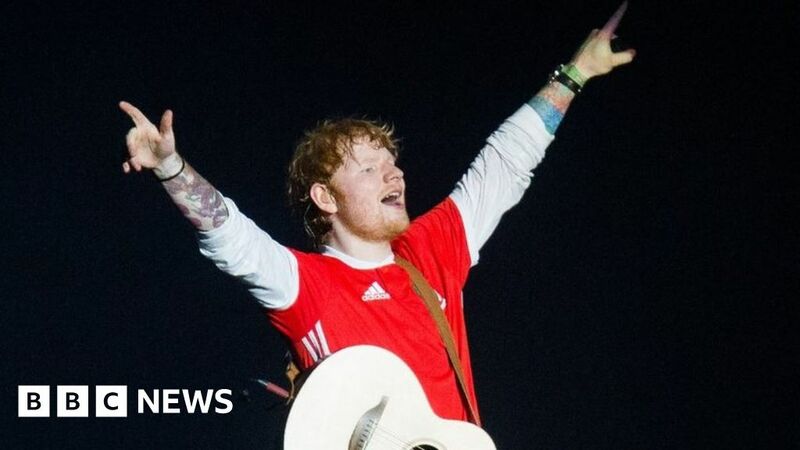 Fans travelling to and from Sheeran’s final night in Cardiff on Sunday have been advised to plan ahead as the only trains running after it finishes at 22:30 BST are to to Newport and Swansea. There are no services to London Paddington because of an unexpected Severn Tunnel closure – so there will be just one service to Cardiff from London an hour before the concert, which will take 40 minutes longer than usual. Rail replacement buses will run directly from Cardiff Central to Bristol Parkway and Bristol Temple Meads. While there will be extra services to Swansea and Newport after the gig, Arriva Trains Wales has warned there will be no trains to towns including Barry, Caerphilly, Pontypridd, Ebbw Vale, Treherbert and Carmarthen. Road closures began in Cardiff at 07:00, the Principality Stadium gates will open at 17:00 and virtually all of the roads in the city centre will close at 17:30. Security to the concert is tight – only small bags are allowed in the stadium while laptops, selfie sticks and umbrellas are banned. Cardiff buses are being diverted out of city centre bus stops while operators have warned train services in the Cardiff area will be busy all day.